It was a wildly successful weekend for Salt Lake Community College basketball. 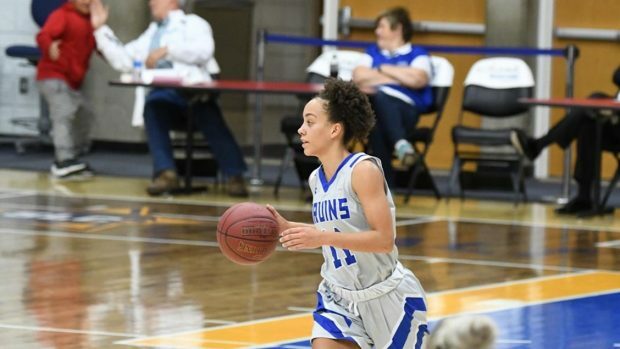 The SLCC men’s and women’s basketball teams each faced Scenic West Athletic Conference rival College of Southern Idaho in their respective Region 18 Tournament final in Ephraim. Sophomore guard Bushmen Ebet delivered the shot of a lifetime as the men bested the Golden Eagles 87-86, while the women were also crowned region champs over CSI with a final score of 79-70. Both basketball teams found out their fate for the tournaments on Monday, March 12. #SelectionMonday, which awards each team their seed in the tournament, took place via livestream on the first-ever NJCAA Selection Show. The men’s team (29-3) was awarded the No. 4 seed and a first-round bye for the 2018 NJCAA Division I Men’s Basketball Championship in Hutchinson, Kansas. The women’s team (26-5) will be the No. 9 seed this year in the NJCAA Division I Women’s Basketball Championship in Lubbock, Texas. With the win, the Bruin men also earned some extra revenge against their rival. Last year, SLCC lost to CSI in the first round of the Region 18 Tournament, and earlier this season, the Golden Eagles handed the Bruins their third loss of the season in an overtime thriller on Feb. 15. 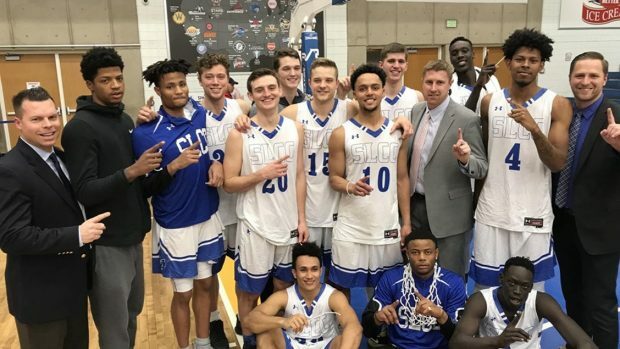 After smashing Snow College 93-67 on Snow’s home floor, SLCC earned a chance to avenge their last loss against CSI and came away with the victory in a back-and-forth championship game. Sophomore forward Christian Gray led the way for the Bruins with 21 points on 10-14 shooting. Gray earned Region 18 Tournament MVP for his performance. “It was big for us. Kind of like a little mountain, little goal to set. Because we’re two good teams, we battle. So, it was good to come out on top,” Gray says. Coming off a big game against Snow College in which he had 16 points, Ebet came through for his team to extend the season. With an 86-84 lead, CSI missed their second of two free-throws. Freshman Matt Lindsey pushed the ball up the floor and found Ebet for the downtown dagger with just six seconds left on the clock. CSI put up an unsuccessful shot as time expired to end the game. “It is the biggest shot of my young career. During the game, I missed a couple threes [pointers] before it. I guess I had to save the best shot for the last shot,” Ebet says. Unlike the men’s team, a game-winning shot was not necessary for the Lady Bruins to down the Golden Eagles. Once again, it was sophomore guard Tia Hay leading the way for SLCC with 32 points on 12-17 shooting. Hay scored 66 points in two games, earning tournament MVP and NJCAA National Player of the Week honors. Hay is quickly becoming one of SLCC’s most decorated athletes. She was also named the 2017-2018 Scenic West Athletic Conference Player of the Year and was recently selected to the Women’s Basketball Coaches Association (WBCA) All-American team as an Honorable Mention. 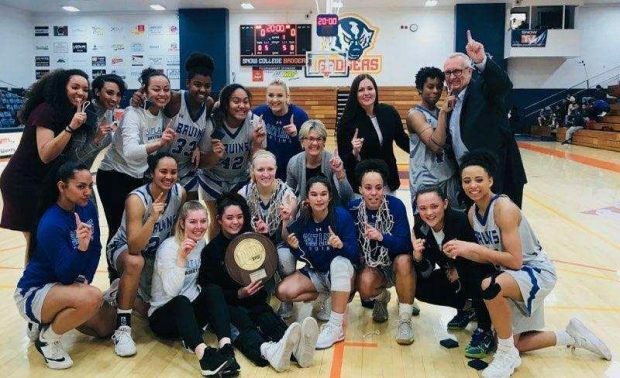 The Bruin women’s basketball team qualified for the NJCAA National Tournament for a remarkable fifth straight year after becoming back-to-back Region 18 Champions. 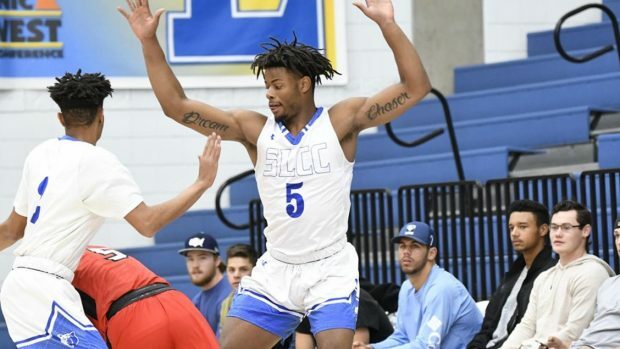 Last year marked the first Final Four appearance for SLCC, but they fell short in the semifinal game to eventual champion Gulf Coast Community College. GCCC will be the two-time defending national champions entering the tournament this year. Before heading off to play at Nationals, both teams will attend the Bruin Send-Off, a free event taking place March 15 from 11 a.m. to 1 p.m. in the Student Event Center at Taylorsville Redwood Campus. Free food, minute-to-win-it games, and many more fun festivities will be taking place. Come wish our Bruins basketball teams luck before their road to the championship!